Looking for a cosy pub to sink a few pints in? 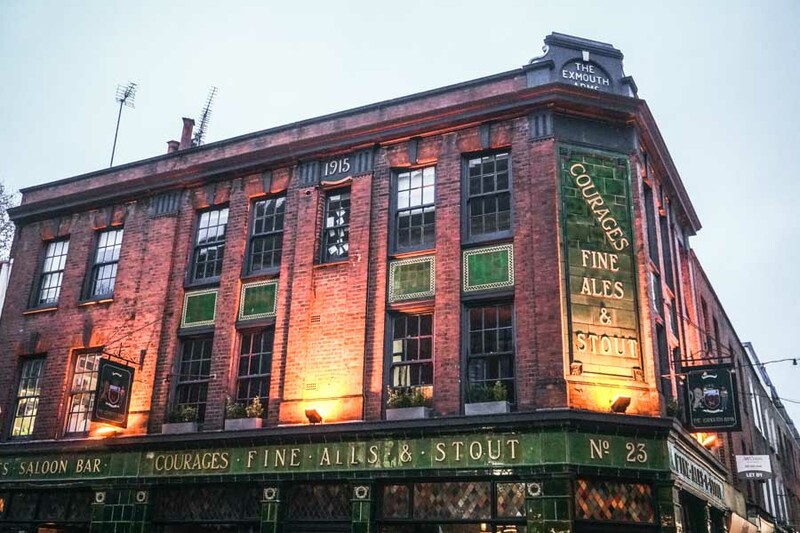 Farringdon and Clerkenwell are brimming with history… and more than their fair share of great pubs. Here’s your guide to the best pubs in Farringdon and Clerkenwell. Sure, cocktail bars are nice – but sometimes you can’t beat a really good pub. Luckily, the neighbouring London areas of Farringdon and Clerkenwell are blessed on the boozer front. Settle in for a drink or two in one of these cool little pubs. The Eagle was the original gastropub in Farringdon, in fact, it was pretty much the original gastropub in London. It’s difficult to remember, but before The Eagle came along, pubs just used to dole out basic meals that were nothing to write home about. The Eagle opened in 1991 and changed everything. Started by Michael Belben and David Eyre, two wannabe restaurateurs who were looking for a more affordable way to start a foodie business, the pub has grown from strength to strength. I’ll admit, it had been a few years since I’d been back to The Eagle before my last visit and I was curious to see whether it had stood the test of time. It has. 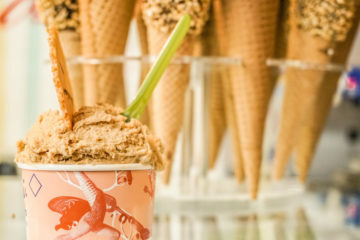 The reasonably-priced daily changing menu is just as punchy, full of flavour and adventurous as it ever was. Turns out The Eagle is still showing London’s gastro pubs how it’s done over 25 years later. Away from the food, the pub offers a decent range of beers on tap and by the bottle – including their very own IPA. Draught beers are an eclectic mix scattered from Red Stripe to Erdinger and lots more in between. Unsurprisingly, wine lovers are well catered to. 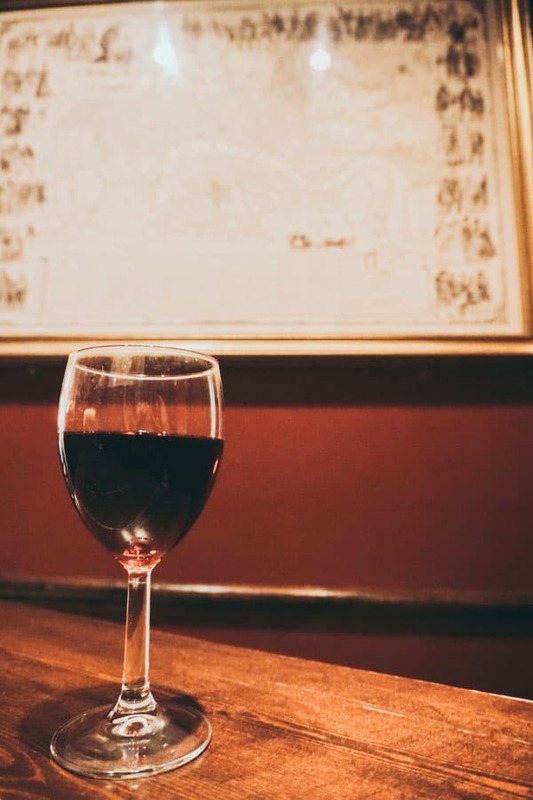 The wine list was my favourite of all the Farringdon pubs – all the old favourites are on there – Malbec, Pinot Grigio – as well as a few rarer offerings like Monastrell and Verdejo. Enjoy. I’m sure you will. Another one of my old favourite pubs in Farringdon, The Fox & Anchor has been a pub since the 1890s. Turns out that with over a century’s practice, they’ve got this whole public house thing down to a fine art. 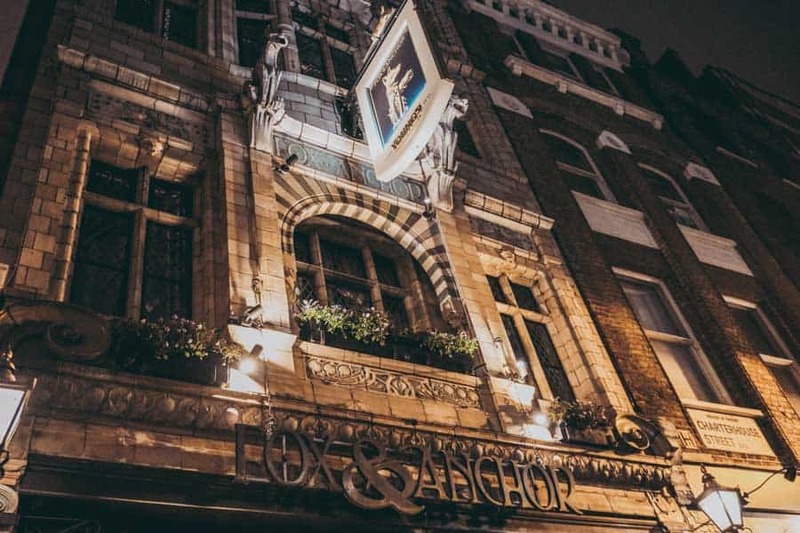 This is one of London’s prettiest old-school boozers, the Grade II listed building features an ornate facade complete with patterned brickwork, ceramic tiles and gargoyles. Tucked away down Charterhouse street, unlike many of the pubs near Farringdon station, The Fox & Anchor has a real neighbourhood feel. Inside, the Art Nouveau interiors are just on the right side of cosy: eclectic paintings line the walls, patterned tin tiles on the ceiling – it’s just the kind of place where you could hole up for a day with a bunch of friends, feeling like you were in someone’s living room. 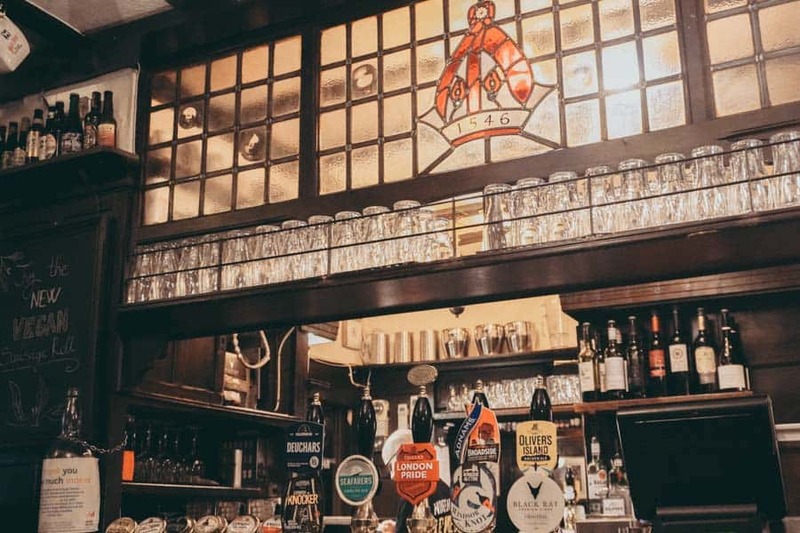 It’s a Young’s pub and the focus is on locally-sourced beers – there’s their own-label ale and other cask beers from smaller breweries from London and the south. 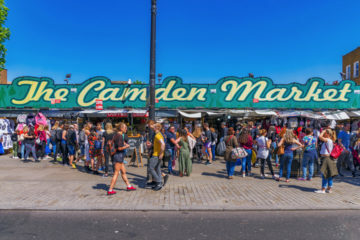 What’s more – the Fox & Anchor opens at 7am on weekdays, 8.30am at weekends (to serve the punters at Smithfield Meat Market around the corner). Pretty much perfect for those days when a cheeky pint and a hearty breakfast are exactly what you need. Oh and there are hotel rooms upstairs if it all gets a bit too much. 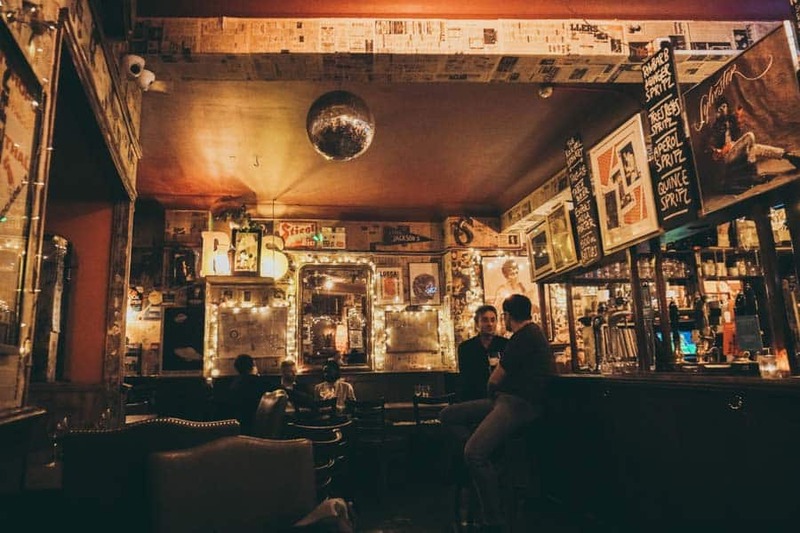 You’ll have a much better chance of finding a needle in a haystack than finding a seat in the miniscule Jerusalem Tavern – but it’s one of the best pubs in Farringdon nonetheless. Owned by St Peter’s Brewery, the building of the Jerusalem Tavern dates all the way back to the 1700s (though the pub itself has only been on the premises since the 1990s). Inside, the pub is a rather charming blend of antiquities meets 21st century – with a no-frills, get what you came for vibe that is increasingly rare in today’s gastropub world. Green and brown walls, rugged wooden floors – you could almost be hoodwinked into thinking that the pub was as old as its building. If you’re lucky enough to nab the seats by the fire, there’s no finer place to be during London’s chilly winters. What did you come for? Mainly the beer. 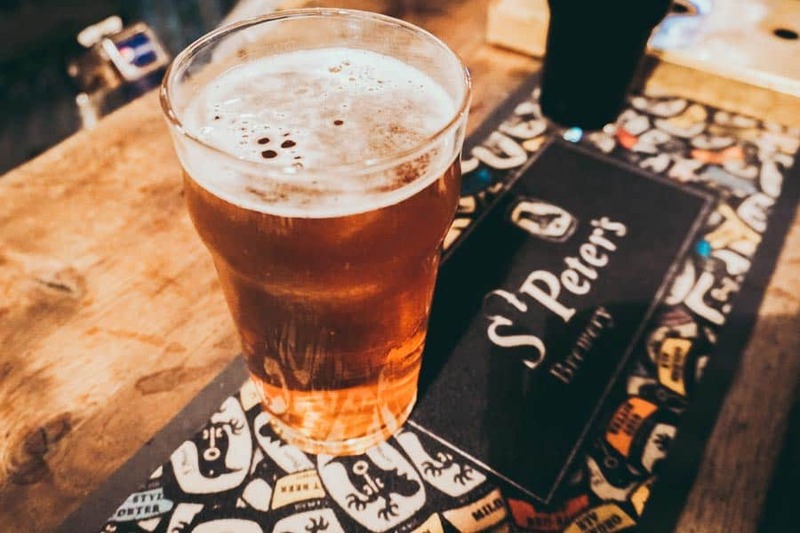 St Peter’s is a brewery based in Suffolk – their wide range of real ales have won many awards over the years. Though the brewing is traditional, the final products are not. Alongside the standard bitters and ales, you’ll find a few unusual ones too – Citrus Beer, Plum Porter – there’s even a gluten free beer to round things off. Billing yourself as the most difficult pub to find in London might not appear to be a great marketing strategy, but it doesn’t seem to have done Ye Olde Mitre any harm. After all, the pub is still going strong and it opened in 1546. So many pubs in London attempt to create the ye olde pub vibe – but it’s always easy to sort the authentic from the pretenders. Ye Olde Mitre is the real deal – it was built on the land of the former Ely Palace, the palace of the Bishop of Ely to serve the bishop’s servants. History marks every corner of the pub. There’s still a cherry tree in a corner of the front room marking the spot where the Bishop’s lands ended and Christopher Hatton’s land began – the two hated each other and the tree was the dividing line between their respective parts of the garden. Fast forward to the modern day – the pub is owned by Fuller’s. Three small rooms and a nicely tucked away beer garden are all it takes to create this a cosy drinking spot. 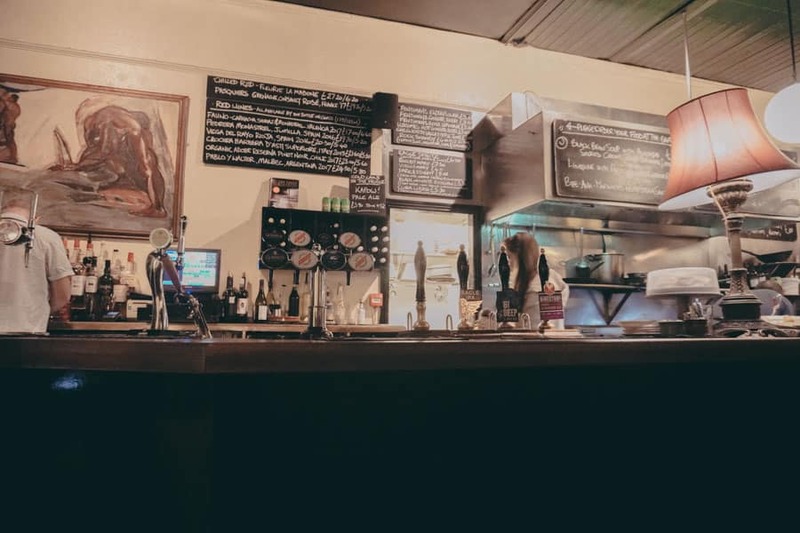 Take your pick from award-winning draught beers – there are always seven real ales on tap (a mix of Fuller’s own and guest ales) and a proper scrumpy cider available. The wine’s decent too. 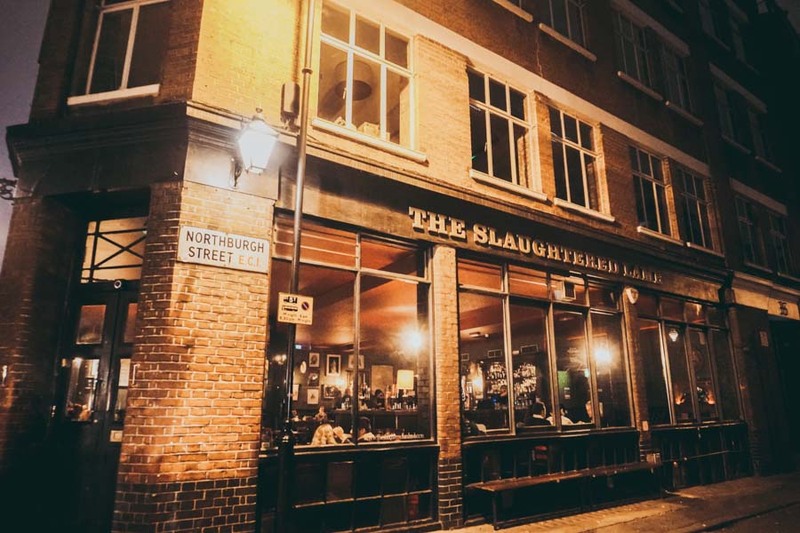 The Slaughtered Lamb stands in stark contrast to many of the Clerkenwell pubs I’ve featured on this list. In truth, it was touch and go whether I included it but it just about made the cut. Let’s start with the good stuff. There’s a cool live-music venue downstairs that hosts a lot of folk and Americana gigs. The venue is intimate and well-reputed for high-quality acoustic gigs. The bad? While this pub is perfectly pleasant during the day – airy windows, lots of light, nice food, decent beers etc etc, at night, well it feels more like a gig venue than a pub. Loud music, snogging teenagers, sticky tables and even stickier floors. I can’t say that Friday night in The Slaughtered Lamb was very much fun. That said, it is nice enough in the day time and if you’re going for a gig, it’s exactly what you’d look for. If you’re going for a quiet night time pint though, you’re better off going elsewhere. The Exmouth Arms is a traditional old school boozer on the corner of Exmouth Market. The pretty red brick facade promises fine ales and stout, and dates the building to 1915. Inside, it’s everything a pub should be – lots of seating, dark corners, low-level light and friendly staff. There’s a good range of craft beers on tap (I was excited to see one from my favourite brewery in Copenhagen, Mikkeller pop up on the list), nice wines and great food. Pub grub can mean anything these days – at The Exmouth it’s a fairly traditional line up (all perfectly executed) with a few touches of magic. Go hungry – portions are on the hearty and yummy side. There are plenty of old pubs in Farringdon – it’s interesting to see how they’ve all developed over time. 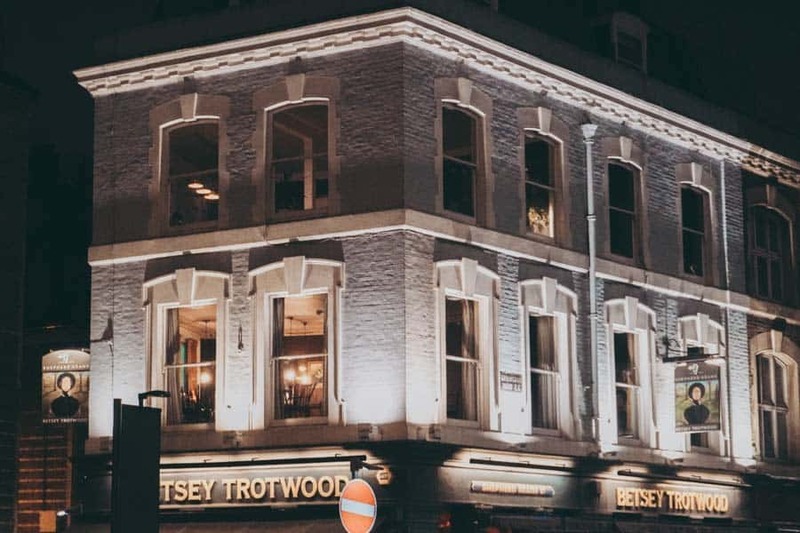 The Betsey Trotwood does the traditional British pub thing down to a T – but adds a serving of live entertainment to keep things exciting. Comedy is the biggest draw (well, away from the booze that is). The Betsey Trotwood hosts several comedy evenings throughout the month, including the weekly Jester Jesters night each Monday. Add live music to the roster and you have a cheery community pub in an area where that’s rarer than you’d think. Drinks-wise, Betsey’s no slacker. You will find a good selection of cask ales, a wide-ish wine selection and some very good single malts behind the bar too. Apart from a blip of 50 years or so, there’s been a Bleeding Heart Tavern on these premises since 1746. I’ll bet those who frequented the tavern in those days wouldn’t recognise the pub they see today. The drunkenness and debauchery have been replaced with fine wines and quiet conversations, the beds of straw for inebriated customers swept away – in short, today’s tavern is a model of respectability. Food is simple and excellent (no surprises seeing as the tavern’s sister The Bleeding Heart around the corner has long been reputed as one of the best restaurants in Farringdon). It’s reasonably-priced too. The beer selection isn’t anything remarkable but there are over 10 wines by the glass, though they err on the expensive side. If there are two of you, see if you can grab the table in the cosy nook up the stairs in the corner – it has to go down as one of London’s cosiest pub spots. The Three Kings is not only one of the best pubs in Clerkenwell – it’s also one of its quirkiest too. The three kings referred to are Elvis (obviously), Henry VIII and… King Kong. A natural triumvirate of course. Inside it all starts to make a bit more sense – well, kind of. There’s music memorabilia everywhere, as well as oddities like a plaster rhino’s head and fairy lights (though my last visit early in the new year, so it may be that the lights weren’t a permanent fixture). The musical theme continues with an upstairs jukebox featuring some very niche choices and frequent live music nights. All in all, a nice and friendly neighbourhood pub. 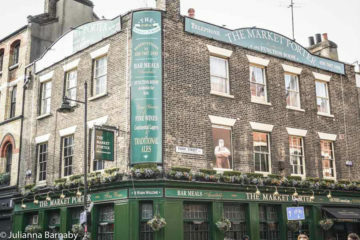 There we have it – the best pubs in Clerkenwell and Farringdon. Booze safely kiddos. 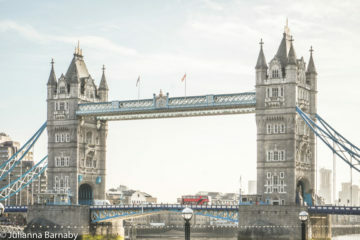 Click here for the pubs featured in this article.